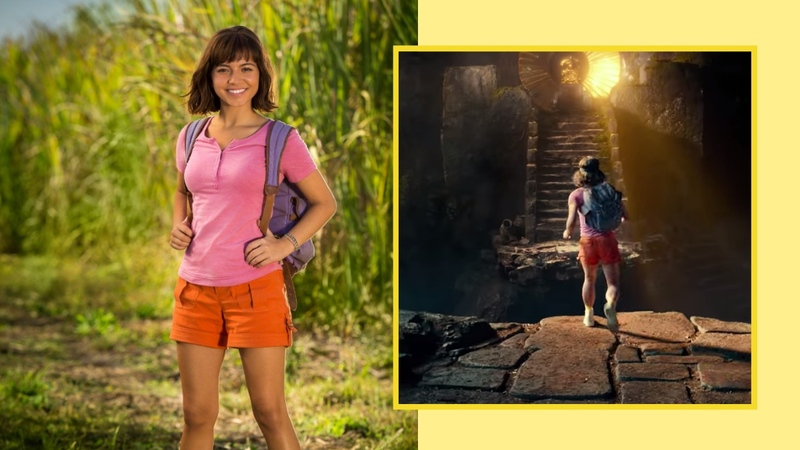 Dora The Explorer hits the big screen in a live-action movie that your godchildren will so love. Dora And The Lost City of Gold takes the explorer and treasure hunter into her high school years and eventually on an adventure. Take your godchildren to see it when it comes out; they’ll love you for it! The upcoming Dora movie moves the little explorer from animation to live-action adventure with teen star Isabela Moner. Instead of the usual kiddie plot, the trailer shows a fun tween flick for kiddos or for those who love action-adventure fantasy movies (raise your hand if you’re one of those—aminin!). The trailer shows Dora’s first foray into high school (awkward! ), after having spent most of her life exploring the jungle with her parents. But as we all know, high school can get pretty tricky, too, so that alone was an adventure for Dora. We love how the animated characters come to life, like Boots (her best friend, a monkey) and cousin Diego (Jeffrey Wahlberg), as they solve the mystery behind a lost city of gold. While the trailer says it’ll be out in cinemas in September, reports say that Dora And The Lost City of Gold is set to hit theaters in the Philippines earlier, by Aug. 14. Save the date for your inaanaks then—or heck, have a me-date if you grew up watching Dora, too.